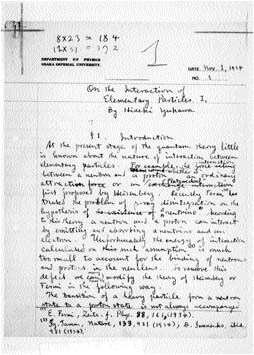 In this 1934 draft manuscript, Japanese physicist Hideki Yukawa predicted the existence of a particle—a meson—with a mass about 200 times that of the electron. At first the muon, discovered in 1937, looked like a good candidate for the meson, but soon it became clear that the muon's properties did not match those predicted by Yukawa. Then, in 1947, Cecil Powell discovered the pi meson, or pion, which did have the predicted meson properties. We know now that the muon is an elementary particle, cousin to the electron, and that mesons, including the pion, are combinations of a quark and an antiquark.